Comedones are clogged pores that fill with sebum (oil and cellular debris). 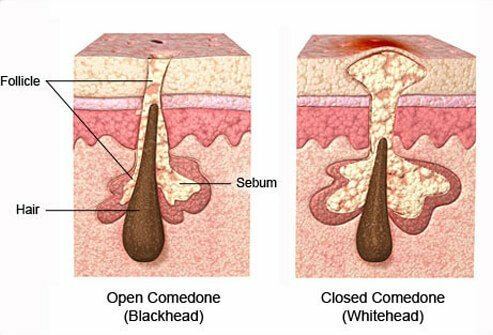 Comedones can be either blackheads or whiteheads depending on how deep they are in the pores and how long they’ve been exposed to air. 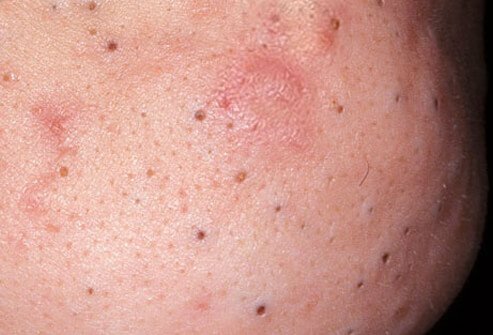 Comedones are the first step toward pimples. The word “comedo” was coined in the late 1800s. It is based on a similar word for parasitic worms, which apparently bare some resemblance to the comedo within a clogged pore. Products that may trigger comedones are called "comedogenic." Makeup labeled "noncomedogenic" is less likely to clog pores and contribute to acne. Blackheads are sometimes called open comedones. Whiteheads are sometimes called closed comedones. They often appear on the face, especially the chin and nose. This type of pimple may be sensitive to the touch. Picking or squeezing can make the inflammation worse and may lead to scarring. 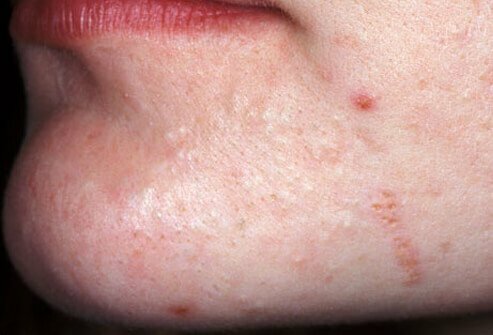 One form of acne is called “papular acne.” That’s acne that has more papules than pustules (more on pustules in the next slide). 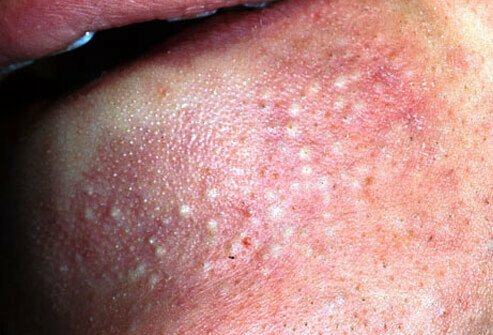 Papular acne is common in people with course/oily skin. 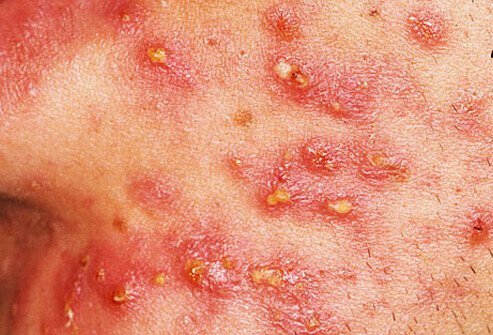 Pustules are another kind of inflamed pimple. They resemble a whitehead with a red ring around the bump. The bump is typically filled with white or yellow pus. 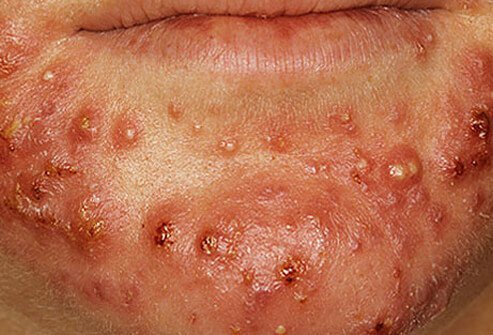 Pustules eventually burst open, releasing all of that oily sebum and bacteria. When they do burst, the bacterial substance causes more inflammation. sweaty areas like the armpit and groin. 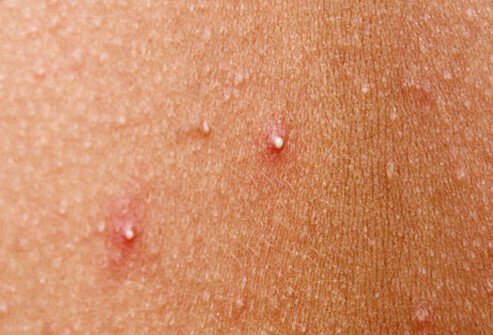 Nodules are forms of papules, but they are bigger and they form more deeply in the skin. These are large, inflamed bumps that feel firm to the touch. 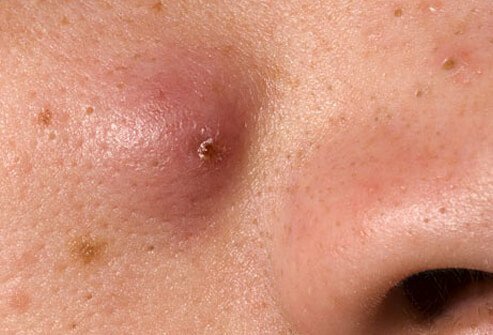 Like nodules, cysts are a more extreme lesion that can result from acne. 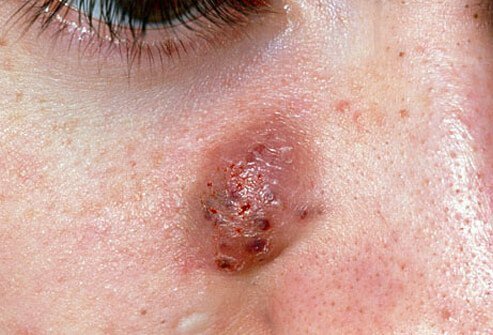 Also like nodules, cysts can be very painful and should be treated by a dermatologist. Acne cysts are closed pockets of tissue filled with pus. They resemble boils. Surgeons can drain or remove cysts. fewer than 30 total lesions. 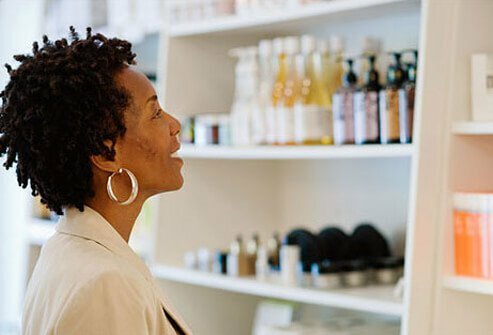 Mild acne is usually treated with over-the-counter topical medicine or self-care. It may take up to eight weeks to see a significant improvement. 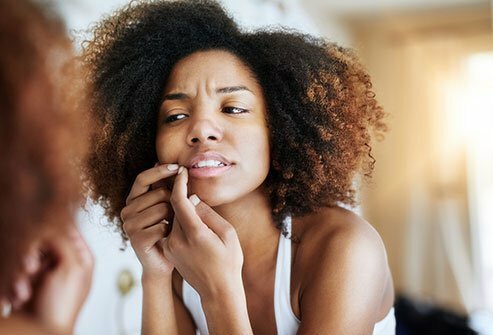 While more severe cases of acne may require either topical or systemic medicine, mild acne symptoms can often be improved by practicing good daily self-care. Gently wash your skin twice a day on the spot of the acne. Use a soap that is mild, and always use a clean washcloth. Work the soap in gently for a minute or two, and do not scrub. Rinse well. Anytime you work up a sweat, wash right after. Sometimes oils from hair can exacerbate acne, so wash your hair at least every other day. For men who shave: wrap a hot towel around your face before shaving to soften the hair, and always shave along your beard’s natural grain. Leave the acne alone. Don’t pop it, don’t squeeze it, don’t scratch it or poke it. Doing so can cause scars and infections. Avoid the sun and sunlamps, especially if you’re on antibiotics for acne. Choose makeup that is water-based (and oil-free!) Avoid oil-based creams and lotions, too. 30 to 125 total lesions. Dermatologists usually recommend prescription medication for moderate to severe acne. It may take several weeks to notice an improvement, and your acne may appear to get worse before it gets better. Multiple inflamed cysts and nodules. 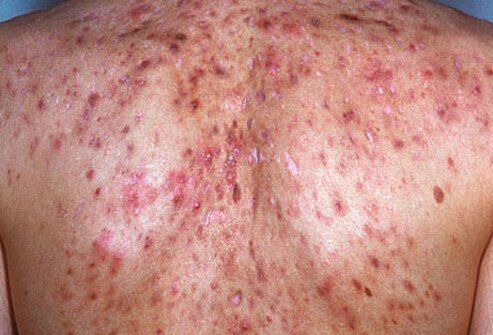 The acne may turn deep red or purple. Acne mechanica is sometimes called "sports-induced acne" because it occurs frequently in athletes. Preventive measures include wearing an absorbent material under sports equipment and showering immediately after activity. Benzoyl peroxide, which treats acne by unclogging skin pores and stopping bacterial growth. Some acne products with benzoyl peroxide include Brevoxyl and Triaz. 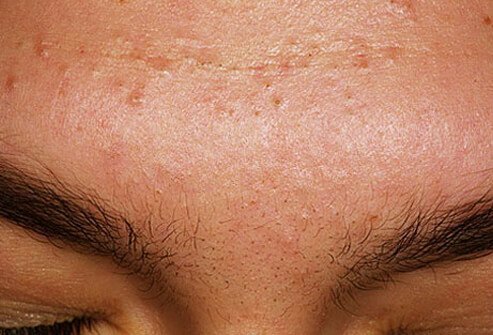 Tretinoin works by affecting the growth of skin cells. 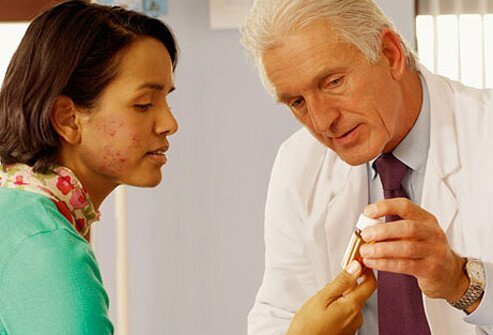 Common acne-fighting medications with tretnoin include Retin-A, Atralin, Refissa, and Tretin-X. Prescription products such as antimicrobial or retinoid creams can be used to treat mild to moderately severe acne. These can be prescribed alone or in combination with other ingredients. isotretinoin (high-dose prescription vitamin A). Isotretinoin is used only in certain severe, cystic acne cases, or in cases where other treatments don't work. A course of isotretinoin treatment requires regular appointments with your dermatologist. David Davis © 2011 Photo Researchers, Inc. All Rights Reserved. AcneNet: "What Causes Acne?," "AcneNet Glossary," "Prescription Medications for Treating Acne," "Treating Severe Acne." Gold, M. Journal of Clinical and Aesthetic Dermatology, April 2009; vol. 2: pp 40-44. Jacoby, David B., and R. M. Youngson. Encyclopedia of Family Health. New York: Marshall Cavendish, 2004; pp 32. National Institute of Arthritis and Musculoskeletal and Skin Diseases: "Q&A Acne." "What Is Acne?" O'Connor, Daniel P., and Fincher, A. Louise. Clinical Pathology for Athletic Trainers: Recognizing Systemic Disease. Thorofare, NJ: SLACK Incorporated, 2008; pp 300. 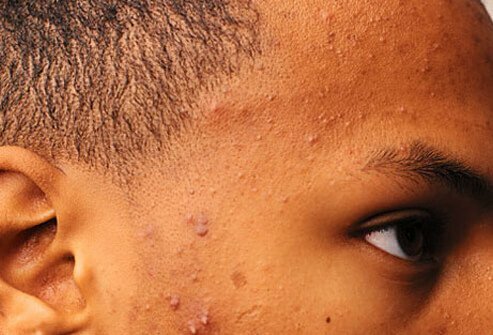 National Institute of Health: "What Is Acne? Fast Facts: An Easy-to-Read Series of Publications for the Public." University of Michigan University Health Service: "Acne." University of Maryland Medical Center: "Blackheads." U.S. National Library of Medicine: "Salicylic Acid Topical." University of Maryland Medical Center: "Whiteheads." University of California, San Francisco Department of Dermatology: "Acne." Kestenbaum, Thelda M., MD. "Definitions of Dermatological Terms." University of California, San Francisco: "Papules." University of Maryland Medical Center: "Pustules." University of Kansas Medical Center, Dermatology Division: Kestenbaum, Thelda M., MD. "Definitions of Dermatological Terms." University of Maryland Medical Center: "Cysts." Asbury University Healthy Students’ Self-Care Guide: "Acne." University of Delaware: Adams, Brian B., MD. "Dermatologic Disorders of the Athlete." University of California, Santa Barbara Science Lab: "How Does Sulfur in Facial Cleansers Help to Eliminate Acne?"